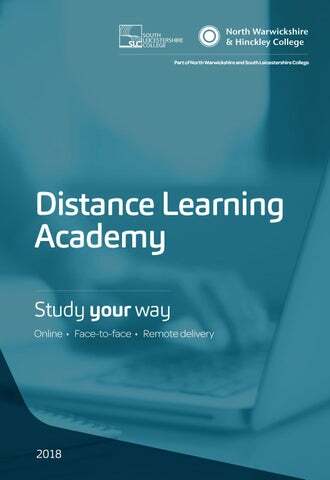 The Distance Learning Academy at North Warwickshire and South Leicestershire College As recently merged Colleges, North Warwickshire & Hinckley College and South Leicestershire College provide a range of accredited qualifications at competitive rates. 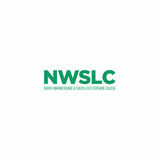 Many courses also receive government funding, significantly reducing costs. Our distance learning courses are ideal for employers looking to upskill their staff and individuals aiming to progress their career. Delivery options We offer three delivery options, designed to minimise costs and fit around your organisational needs. Get started straight away! If you are an individual our team will set up a telephone or face-to-face induction with you. If you are a business, our team will work with you to set up a flexible delivery programme that best fits your needs. Get in touch to get started! Health and Wellbeing This section includes courses that are relevant to all sectors, specifically the Healthcare and Education sectors. These courses are designed to develop understanding of the importance of mental and physical health and wellbeing as well as effective communication and management in a workplace setting. Ideal for: those working within education and healthcare settings. Ideal for: those working in a health and care setting. Ideal for: those working in a health and social care setting. Course content: This course covers a range of medical conditions and how they affect individuals. Course content: Designed for learners working in health and social care who want to develop an understanding of how to deliver effective customer service in line with customer expectations. Ideal for: anyone working in a healthcare or social care environment. Ideal for: new and existing childcare practitioners. Course content: •	The impact and consequences of a fall •	Risks and hazards which contribute to falls •	Reducing the risk of falls. Ideal for: those working in an adult health and social care environment. Course content: Learners will investigate the principles and how they are applied in everyday work contexts. They will also have an opportunity to examine the dilemmas that can arise and the consequences when these principles are not upheld. Children and young people’s mental health in context Factors which may affect children and young people’s mental health The impact of children and young people’s mental health concern Children and young people’s mental health concerns How to support children and young people with mental health concerns. Prevention & Control of Infection in Health Care Settings Ideal for: those working in a wide range of health and care settings including hospitals. Recognising the signs of abuse How to reduce the risk of radicalisation Potential consequences of illegal online activity How to reduce the risk of radicalisation How to recognise signs of abuse or potential harm How to reduce the risks posed online. Ideal for: those working within a care setting. Ideal for: those working within a health and care setting. Ideal for: those working in sport and recreation, exercise and fitness, hospitality and catering and healthcare. Also suitable for those with a general interest in nutrition and health. Ideal for: those working within a medical and health and care setting. Understanding Specific Learning Difficulties Ideal for: those working within healthcare, social care and education contexts and anyone looking to improve their knowledge and awareness in this area. Course content: This qualification gives learners knowledge of different specific learning difficulties, how they are diagnosed and how individuals can be supported. Specific learning difficulties include: Attention Deficit Hyperactivity Disorder (ADHD), Dyslexia, Developmental Coordination Disorder, Dyscalculia, Autism. Business, Administration and Management These courses are deigned to develop the communication, leadership and customer service skills that are vital to business success. Increase awareness of understanding and meeting customers’ needs Giving a great customer experience Learning from feedback Promoting products and services.